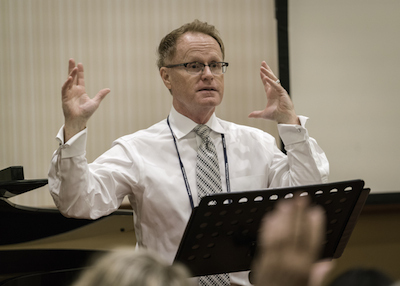 The NATS Winter Workshop in conjunction with the National Opera Association in Indianapolis was a rousing success due to our excellent clinicians and the added benefit of sessions programmed by NOA. The sessions were also illuminating for voice teachers, with many stating how much they appreciated the in-depth information and discussion. Other NATS presenters included Julia Faulkner, director of vocal studies for The Patrick G. and Shirley W. Ryan Opera Center, Lyric Opera of Chicago. In a conversation with Allen Henderson, Faulkner shared her ideas on Teaching the Elite Singer, and also presented a master class in collaboration with Margo Garrett where they coached singer/pianist teams in operatic repertoire. Attendees also enjoyed a presentation by Rena Sharon entitled Multi-Media in Art Song Performance: Breaking Traditions to Preserve a Global Legacy. A special treat was a performance of a newly created piece for two singers, trombone and piano, directed by Gayle Shay and performed by her students and colleagues from Vanderbilt University. Pianist David Duncan also taught a master class on Stylistic Performance of the Great American Songbook and worked with an excellent group of singers. A special opportunity involved a visit to the Great American Songbook Foundation and Archives (founded by Michael Feinstein) in neighboring Carmel. We were treated to a grand tour of the facilities at the Palladium Arts Center and the incredible American Songbook Archive, where they are preserving a vast collection of some of the seminal works of the Songbook. Many thanks to the staff for hosting us. Top right: David Duncan on authentic performance of the Great American Songbook. Above, 1st row, left to right: David Duncan in collaboration at Cabaret night; the distinguished panel for the “Heritage and Hope From the African American Experience" session; George Shirley performing “It Ain’t Necessarily So”; Vanderbilt University performers and Gayle Shay. Above, 2nd row, left to right: Donna Loewy, Margo Garrett and Elvia Pucinelli discuss collaborative piano program development; Donnie Ray Albert; Julia Faulkner makes a point to a singer in her master class. This report first appeared in the Spring 2016 edition of Inter Nos, the semiannual publication that provides important information about the work of NATS to its members. Each issue of Inter Nos includes the "Independent Voices" section, focused on the work of independent teachers. View the current Inter Nos issue here.